While Ollie learns to be a better teacher (by admitting that using the methods of a group of murdering Russian psychopaths might not be the best way to train super-heroes), the episode's other subplot takes place thousands of miles away where Diggle (David Ramsey) discovers life in the military isn't all that it's cracked up to be. Running into an ambush, Diggle is betrayed by his superiors and framed for the crime they plan to commit. Does this mean Diggle is on the fast-track back to Star City (by way of Federal Prison)? All the episodes themes fit well together this week. Ragman is certainly an odd choice to bring into the fold, but his power-set works well with the show's special effects budget. 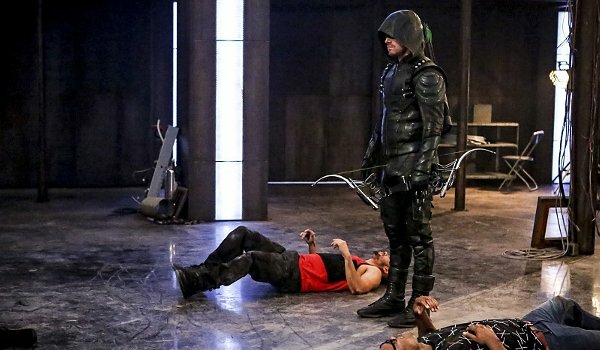 Tobias Church (Chad L. Coleman) comes to a rather inglorious end in the episode's close as the gangster is killed at the hands of the new archer in town who is revealed to be Prometheus (a character whose checkered comic book past should give DC Comics readers pause, but Arrow made Ragman work for an episode so who knows? ).